Each artist within Siren brings a distinct balance of perspective and experiences. As a collective we are focused on the sustainability of our practices and choices to affect the community and earth in only positive ways. Our natural curiosity leads us to question the spirit of nature, art and science, and how we can bring that into our craft. Kate Ellis | Kate opened Siren Salon in downtown Vancouver Washington in July of 2013. She completed her cosmetology degree at the Aveda Institute of Portland and has been in the industry for 9 years! Kate has experience with several color and product lines, is a proud Joico Certified Colorist, Certified Pureologist, and is certified in Hot Heads Hair Extensions. She is thoroughly obsessed with hair, with passion in all aspects of her art, from the creation of a beautiful and unique cut & color... to the relationships and inspirations formed through her craft, to participating in fashion shows and other community events & charities. For more about Siren's Owner, simply click the link! Lynsey Bloemke | a Siren since September of 2015, Lynsey was born in Alaska, but has made her home in the PNW with her husband Shane for the past several years. She is fully licensed in cosmetology, and loves pampering her clients with every service she provides. Lynsey is exceptionally talented with blondes, red heads, and free hand hair painting. Her smile lights up a room and her friendly calm presence makes anyone feel immediately at ease. Siren Lynsey is full time in the salon, please view her portfolio on Instagram! Melissa Moon | A Siren since December 2018, She is a fully licensed cosmetologist, she is very passionate about color + hair extensions and loves finding that perfect cut and color for her clients. She loves to learn, and is always seeking new ways to educate herself and her clients. She is certified in Indy Hand-Tied Hair Extensions + Hot Heads Tape-ins, and Brazilian Blowouts. She specializes in natural coloring as a balayage artist, and strongly believes in using Olaplex to insure the health and integrity of her clients hair! In her spare time, she is a photographer and loves to cook. She is available full time in the salon! Gabrielle Chase | A Siren since January 2015, Gabrielle has been a fully licensed cosmetologist since 2009. She has a diverse background in the industry, from working as an employee in the largest salon in Arizona, to independently working at our boutique collective, here in the PNW. Gabrielle is passionate about giving her guest an unparalleled experience within the salon, and specializes in Razor Haircutting, Brazilian Blowouts, creative hair painting, and Hot Head Hair Extensions. View more from her portfolio on Instagram, and book with her at styleseat.com/sirengabrielle. 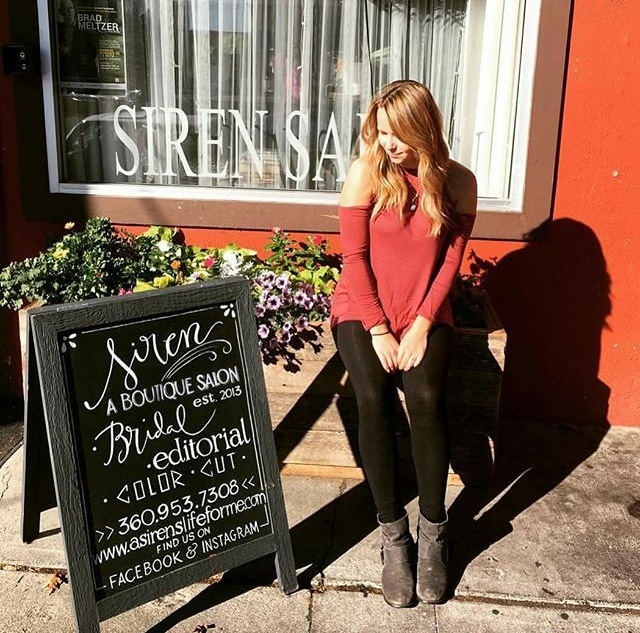 Gigi Johnston | A Siren since September 2016, Gigi is a fully licensed cosmetologist specializing in Brazilian Blowouts, Hot Heads Hair Extensions, Blondes and Balayage. Gigi is passionate about furthering her education, and attends classes regularly with the Sirens. She is so fun and outgoing, and loves making her clients feel beautiful. Gigi looks forward to meeting you! View more from her portfolio on Instagram.